This past weekend, I had the pleasure of meeting Emily Guzman and her family as I joined them on a caravan from Durham, NC to Lumpkin, GA where her husband has been detained at the largest private prison facility in the nation, Stewart Detention Center. Stewart is a CCA operated facility that has more inmates than Lumpkin’s total population. We left mid-morning for Lumpkin and arrived later that night. After ten plus hours of driving, we arrived at El Refugio, a home in Lumpkin that welcomes families of immigrant detainees and provides them with free lodging and food during their visit to Stewart. Anton Flores, an activist and leading member of the Georgia Detention Watch Network, founded El Refugio in hope of providing families with a safe space who have traveled long distances in order to visit their family members in detention. During the course of the weekend, I stayed with Emily and her family at El Refugio where I had the opportunity to meet other families who have family members detained at Stewart. Moreover, I had the special opportunity to follow Emily’s journey as she waited to attend her husband, Pedro’s, final court hearing on Monday, May 16th. Little did I know how this experience would impact me. I had never stepped foot in a private detention facility—or have heard from so many people—activists and family members alike—reiterate Stewart’s failure to meet certain ICE standards but also share with me their horrifying experiences as to how ICE detained their family members in the first place. I learned from one woman, who would like to remain anonymous, that ICE detained her husband at his children’s soccer game because he did not have a valid ID on him. His three children witnessed everything—her daughter called her to notify her of what had happened. She hasn’t been able to visit her husband at Stewart because she is undocumented. The first thing that Stewart’s personnel ask you when you visit the prison is to provide a driver’s license or other valid ID. The fact that this woman hasn’t been able to visit her husband because she is afraid to is unacceptable and deplorable. Her story is one of many. After talking to several activists at El Refugio who visit immigrant detainees at Stewart on a periodic basis, these stories start sounding more and more the same—which reflects a disturbing pattern. Lumpkin has only one restaurant in the town—cell phone coverage is literally non-existent—and there is no real place where families can rest while they visit Stewart. The nearest town with a hotel is Richland, GA. All of these factors make it even more difficult for families to visit their family members. El Refugio is currently the only safe place where families can rest or congregate while they visit detainees at Stewart. As I spent more time with Emily, I came to learn that her husband, Pedro, has been detained for nineteen months due to clerical errors that his mother made during her residency interview. When Pedro was scheduled an order to appear in court, ICE sent this order to the wrong address. Because he failed to appear in court, ICE later arrested Pedro at his residence in front of his family. 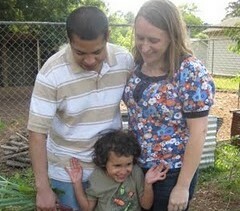 Both Emily and her four-year-old son, Logan, are US citizens. Pedro came to the United States when he was eight-years-old—he has not been to Guatemala, his native country, since then. Pedro knows no one in Guatemala and doesn’t have any current family there. The separation that Emily and her family has endured has not only been strenuous on their daily lives and damaged their psychological health but also is a story that other families are currently experiencing as a result of a failed immigration system and a for profit private prison industry. I attended Pedro’s final court date on Monday—and I have to say that hearing Emily testify—and literally plead to a judge—to let her husband stay in the United States has been one of the most heart wrenching moments that I have witnessed in my life. I couldn’t hold back my own tears—even if I had wanted to. Emily works a full time job as a mental health therapist and regularly blogs about her experience, aside from being a single mother. I attended the final court date where the judge granted Pedro relief—the family was beyond ecstatic and overwhelmed—and I must say that I felt very privileged that Emily and her family allowed me to be there with them during this momentous moment. I had never been to Durham or Georgia before my visit with the Guzman family—and I feel extremely honored that they opened their hearts to me. I also feel very lucky to have had the opportunity to follow them on this journey with my camera as I documented Emily’s journey. This trip has taught me how broken the immigration system really is and how it continues to disrupt families. Even more importantly, I witnessed first hand how private entities like CCA are profiting at the expense of human lives like Pedro’s or the husband of the woman that I spoke to. Emily’s story is just one of countless of other victim’s stories. With the launch of our new campaign, Immigrants for Sale, we will be highlighting Emily’s story, among others. I invite you to follow her story on immigrantsforsale.org, as well as how private prisons operated by CCA and GEO Group continue to profit and thrive from detaining undocumented immigrants.